Connectivity is shifting the lighting industry from analog to digital. To facilitate the transition, Enlighted is partnering with lighting manufacturers to deliver embedded smart lighting solutions through integrated luminaires. 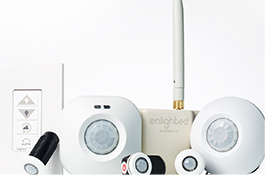 Enlighted’s cutting edge technology transforms standard luminaires into IoT-compatible devices. Partnering with Enlighted adds value to Luminaire OEM product lines by taking lighting beyond illumination. Enlighted takes pride in its OEM partnerships and recognizes the key role Luminaire OEMs play in streamlining integration of IoT into commercial real estate. It all starts with selecting the right Enlighted sensor based on luminaire form factor and application. Consider the driver used, IP rating of the luminaire and typical mounting height. Integrate Enlighted components as needed, then wire and test. It’s that simple. Let us show you how. Enlighted works closely with Luminaire OEM teams to sell integrated solutions to our Fortune 500 clients. Specifiers also come to us looking for integrated solutions for their designs. Enlighted can empower you to grow your business and develop innovative luminaires with the added value of advanced controls. Get the Enlighted advantage today. Enlighted partners with the industry’s leading luminaire manufacturers to offer its customers a broad range of luminaires to select from. An integrated luminaire solution is key to the deployment of a connected lighting strategy. Enlighted is committed to growing its partnerships with key Luminaire OEM’s in order to expand the number of connected products available to specifiers and end users in various vertical markets. Click the logos below to learn more about each partner. Architectural Lighting Works (ALW) designs and manufactures innovative luminaires with elegant, balanced shapes and strong, understated lines. By combining high-performance reflectors with the most energy efficient LED sources, configurations are tailor-made to specifiers’ specific project requirements. Frame Your Vision… to Your Exact Specifications… Beyond All Expectations. Lighting designed around you. At Amerlux®, we’ll stop at nothing to help you realize your vision. We work closely with you every step of the way, from design through construction, to ensure total success—and total satisfaction. We’re fueled by passion—a passion to consistently deliver in a fraction of the time of our competitors, even on short-run custom orders. A passion for making sure every order is accurate, every product performs flawlessly, and every one of our customers is successful. ATG Electronics is committed to engineering the highest quality of cutting-edge LED products with a standard of excellence in performance, expertise, and customer service. Founded in 1991 and still family-owned and managed, Axis Lighting has grown to be an important source for architectural lighting across North America. The company, located in Montreal, Canada, operates a 100,000 square foot manufacturing facility with on-site design, engineering, and marketing staff. Since 1993, Birchwood Lighting has designed and manufactured high-quality specification grade light fixtures tailored to meet the demands of the architectural, commercial and retail design communities. Cool Lite has an in-depth understanding of your LED lighting needs, going beyond the traditional Industry scope evaluating your specific application, and recommend the best solution. When you’re looking to upgrade to LED lighting don’t settle, make sure you look at all options. Coronet continues to grow and exceed expectations in producing high-end architectural luminaires quickly and efficiently. Our fixture’s architecturally sleek appearance fits perfectly in modern commercial spaces and are designed with ease of installation in mind. Day-O-Lite designs and manufactures LED and fluorescent luminaires for the interior architectural specification market. Core product lines consist of recessed, linear suspended, perimeter and wall mount luminaires designed primarily for healthcare, education, office and national account applications. Day-O-Lite also provides a variety of custom product services. DECO Lighting, America’s leading green lighting technology manufacturer, a division of DECO Enterprises, specializes in the manufacturing of innovative, next-generation LED lighting solutions that improve lighting quality, improve efficiency, and enhance the environment through reduced energy consumption. Finelite focuses on the design and manufacture of high-performance, environmentally sustainable lighting systems for office, healthcare, and educational facilities. Our 20-year commitment to energy-efficient LED and fluorescent lighting systems has brought innovation and unmatched customer service. Since our inception in 2011, Fluxwerx has quickly established itself at the forefront of LED lighting technology, with a distinctive product offering and breakthrough proprietary anidolic optics technology that offers substantial energy savings, lighting quality, and remarkable lifetime. Focal Point, The Art of Light, focuses on creating exceptional luminaires that stand the test of time. We enhance environments where people live, work and gather by delivering optimal illumination to comfortably define the space and its purpose, while remaining at the forefront of technology. We believe great lighting isn’t just about meeting technical design requirements; it’s about creating beautiful, functional luminaires that maximize efficiency and enable connectivity. We are proud to call ourselves lighting people – an independent provider of sustainable, American-built lighting solutions that make a difference in lives and spaces. Illumipure is a leader in LED design and manufacturing focused on the Healthcare and Horticulture markets. Their illumiPure TruWhite™ LEDs treat the growth of molds and fungi in sterile environments while the illumiGrow™ series is based on patented technology to provide efficient grow light conditions in green houses, grow rooms & vertical farms. Since its inception in 2003, ILP has focused its business solely on manufacturing high efficiency lighting products for a wide variety of commercial, industrial, and outdoor applications, providing the most comprehensive line of LED and Fluorescent fixtures on the market. Established in 1988, LA Lighting designs and manufactures energy efficient, specification grade LED and Fluorescent lighting fixtures for commercial and industrial applications. LA Lighting has a broad range of standard fixtures along with custom capabilities to meet any job requirement and lead time. The Lighting Quotient designs, engineers and manufactures advanced luminaires for architects, lighting designers, interiors experts and the entire professional lighting community. While other LED lighting manufacturers have their roots in either electronics or traditional lighting, Lumenpulse’s distinctive combination of strong industrial design and electronics knowhow has enabled the company to innovate ahead of its rivals and to offer more options for sustainable interior and exterior lighting. At LumenWerx, our primary goal going forward – as it has been over the last two decades – is to respond to new opportunities with the next generation of luminaries. This entirely new product line represents the latest in LED technology paired with cutting edge optics, electronics and thermal management and is available in recessed, surface and pendant mounted options. Luminii creates customizable, quality-tested specification grade commercial LED lighting that allows stunning architectural projects to shine. Client support that offers complete peace of mind. MaxLite has more than 20 years of experience providing certified, energy efficient lighting solutions to the architectural, commercial, industrial and residential markets. One of the first movers into LED technology in the industry, MaxLite offers an extensive line of quality, certified indoor and outdoor LED lamps and luminaires. Established in 1946 as the first fluorescent tube was being introduced, the company has grown to be a fully integrated manufacturer of predominately fluorescent luminaires. Now with the LED light source growing exponentially, we have positioned ourselves to offer many specification grade LED luminaires. We have engineered these LED luminaires from the ground up, making the luminaires fit the light source. Orion is leading the transformation of commercial and industrial buildings with state-of-the-art energy efficient lighting systems and retrofit lighting solutions. Orion manufactures and markets a cutting edge portfolio of products encompassing LED solid state lighting and high intensity fluorescent lighting. Pinnacle Architectural Lighting is a family owned and operated lighting manufacturer based in Denver, CO. Our commitment to creative design, quality manufacturing, short lead-times and understanding our customers’ needs has allowed us to quickly grow to be a leader in the lighting and design community. Even with 60-plus years of industry-leading expertise, Prudential Ltg. is looking everywhere but back. We’ve fully embraced the LED frenzy with an onslaught of beautifully designed, remarkably controlled and amazingly efficient luminaires, all thoughtfully engineered and meticulously manufactured right here in Los Angeles. Incorporating leading edge technologies in drivers, light emitting diodes (LED), optics and wireless dimming control systems, Raffino LED Lighting designs and manufactures commercial grade LED lighting fixtures and LED retrofit kits that deliver sustainable lighting solutions for the energy efficient upgrade and new construction markets. Selux offers a comprehensive range of high-quality architectural light fixtures, including solar powered, dark-sky certified, innovative luminaires designed to help create exceptional interior and exterior spaces in which to live. We are driven by innovation and passion for what we do. We are an established and dynamic manufacturer, SOLO Lighting GmbH is specialized in energy-efficient and intelligent lighting systems. Not only are we far ahead of our competitors in providing trendsetting solutions with a top price-performance ratio, we are also able to work within tight timeframes. This is due to our strong network of regional and innovative partners. Our work is service-oriented and we will look after you from the evaluation of your needs and the planning stage to the installation and assembly. Our lamps will be tailored perfectly to your requirements and needs and will be manufactured individually for you. TRiALED is an professional manufacturer of LED lights and fixtures for commercial and industrial use. All products of TRiALED are manufactured in Germany. For over 25 years, The US Pole Company, Inc has been making quality products for the Outdoor Lighting Industry. From the beginning, the goal was always to be the best Outdoor Lighting Company, an ideal that is kept in mind each and every day. Today, the US Pole Company Inc continues to strive after it’s original goal through vertical integration, diversity of product, and manufacturing in the United States. USAI Lighting is dedicated to staying ahead of the technology curve and effectively translating the needs of specifiers into forward thinking, high performing and beautiful lighting products. We believe that less is more and continue to develop small and compact cutting edge products that deliver increasing performance and energy savings – solving even the most complex challenges faced by specifiers today. For over 30 years, XtraLight has invented, patented, and manufactured a wide range of industrial and commercial LED lighting products. XtraLight is the most responsive lighting manufacturer in the market and has an extensive portfolio of outdoor and indoor LED lighting solutions. All products are made to order in Houston, Texas with a standard lead time of 7-15 business days and are backed by an industry leading 10-year warranty. Enlighted sensors can detect, measure and analyze occupancy, daylight, motion, temperature and power consumption all-in-one? In partnership with Enlighted, we are changing the future of building management by creating beautifully lit environments that are safer, smarter, and more controlled than ever before. Learn how to integrate Enlighted sensors into luminaires to add value, differentiate and transform lighting beyond basic building functionality.